I have returned! I actually got back last Saturday but caught a cold on the plane back and have been a little out of it. Although the weather was not ideal (two days of sun out of ten days in Turkey and a day and a half of rain in Athens), we had a great time. We especially loved our visit to Kapadokya in the center of the country--it has amazing geological formations (pictured at the top of the post) and fantastic hiking. Which I was able to do as I was cleared to leave the US without the boot. What a relief! You can see all of my photos here. I went into a sewing mania before I left. It was almost to the level of unhealthy. Well, let's be real. It *was* unhealthy. I called Cidell and begged her to stop me. I was acting like a true addict, and kept saying, "OK, this really is the last one." And then I would sneak and sew something else. Because I sewed so much it was more like shopping than planning. I just wanted a lot of pieces to choose from! In the end, I didn't pack quite right because it was much colder than the weather had predicted but I survived. I will eventually (I hope) blog about most of the pieces individually, but here's a few sneak peeks (click the photos to enlarge). A wrap dress out of the fantastic border print knit that was a gift from Marji (I also managed to squeeze another dress and a skirt out of this fabric, quite a feat as it was a double border, double directional print). 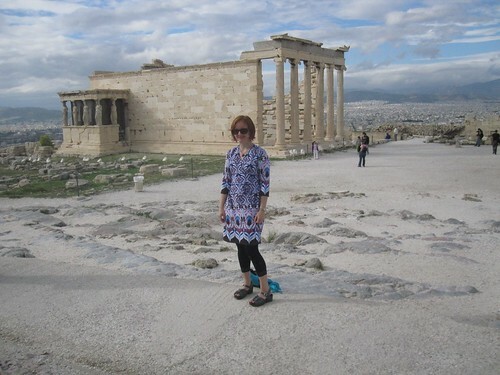 I'm pictured here on the Acropolis in Athens in front of the Erechtheion. I persuaded the friendly German guy who took my picture to take another after a sudden gust of wind blew the skirt open to the waist in the first photo! A wrap sweater, made from a gold sweaterknit I bought ages ago for the very purpose of making a wrap sweater. It's amazing when things actually happen as planned. I rubbed the pattern off a sweater I bought from H&M about 6 years ago. I loved the sweater so much I went back and bought it in the other color they had and I wear them all the time. I'm glad I finally got around to making this into a pattern! Also glad I got around to making it for the trip, as many days I wore two sweaters and a jacket to stay warm, so I was glad to have the extra layer. In addition to these pieces, I made two more dresses (both came), four tops (two came), a skirt, a nightgown, and a sunhat (the very, very last piece made at midnight the night before departure--really needn't have bothered on that one, lol!!!). I was looking forward to fabric shopping in the Grand Bazaar, as the little map in my guidebook showed a whole "street" of fabric shops. Well, I think home sewing is about as popular in Turkey as here because there were only 4 or 5 fabric stands, mostly with fancy sequined type fabric. I did manage to find two pieces. 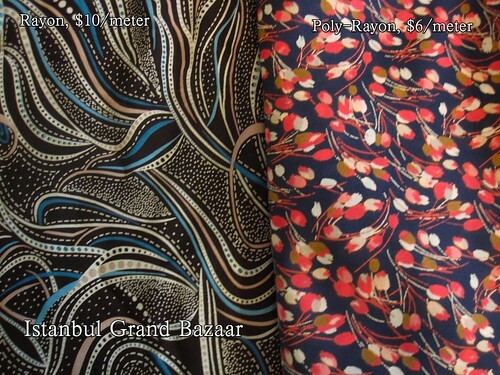 The one on the left was sold to me as cotton; I was suspicious of how soft it was but liked the print. When I pulled out out of the washing machine I confirmed for sure that it is rayon as it had that papery, woody texture. Oh well. The piece on the right I purchased from a man who spoke a little more English than I do Turkish (6 words instead of 4) so he didn't represent anything to me about the fiber content, and I knew it was poly anyway. I think it may be a rayon-poly blend, based on the burn test (a quick bright flame with almost no odor, but a hard bead after extinguishing). I just love the delicate print. Now it's back to real life (*sigh*) and hopefully a healthier, more balanced relationship with my sewing machine. Wow, Turkey looks like a beautiful place. I love seeing the photos of you wearing your sewn garments in such an exotic locale. Just like a fashion photo shoot. All the outfits look fantastic. Welcome back! Very happy you had a great time. I love it in Turkey. Glad you are back safe and sound...and that you had a wonderful time! I concur with Audrey. It is like seeing a photo shoot ~ the model wearing designer gear (designed by TrenaB) in exotic locales. Thanks for sharing! Wow - looks like you had an amazing trip, your photographs are wonderful! I bet you were fabulously dressed every single day. Nice fabric finds - when you do get to make them up it will be so nice because the garments will always remind you of a lovely vacation. I love the pieces you made, and wow - a jacket, too. Your stunt sewing tale is too funny, and you made good use of your pieces! Great pictures, and I'm glad you had such a good time. I *love* when you come back for vacations! Friday nights just weren't the same. OOoh! I don't know which piece I like best! Sounds like you had a great trip. I'm sorry I missed you when I was in Baltimore but I can't wait to see the travel wardrobe. I completely understand your manic episode. Back in 99, I made my mother a 12-pc SWAP (didn't even know the concept then) for her first trip to France. Impressed even my relatives there, LOL!!! Love your photos. I also think it's fun that we're semi fabric twins! I have that same fuchsia lambswool, I think mine might become a skirt. I also have that same border print, which is a maxi dress. I love what you've done with your pieces -- jacket and dress are lovely. Wait-a-sec....?! Both feet in (regular, normal, non-therapeutic) shoes?!!! Bravo, how happy you must've been with your doc! Loved your cowl-top detailed examination in the last post. Beautiful fabric, too! Much appreciated: I desperately need tips for cute (and quick to make!) tops! How great can it get, fabric shopping in another country, must be great! Welcome back! I'm glad that you were able to travel with out the boot. Thank you for sharing your pictures ahead of time. I hope that you are able to do the travelogue-photoshoot blog entries. I find them especially delightful. But even if you cannot blog about the trip, thank you for sharing the pics! Welcome back! Turkey & Athens look like fun from your photos. I like the look of yor new jacket and I can't wait to hear/see more details. Oh that guy in one of your photos is way cute too! I hope he belongs to you as well. LOL! I love your trip photos. 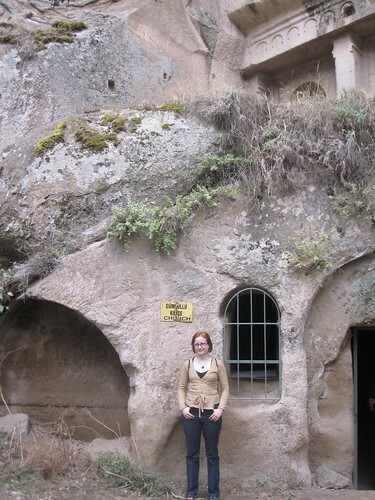 I'm dying to spend some time in Turkey. 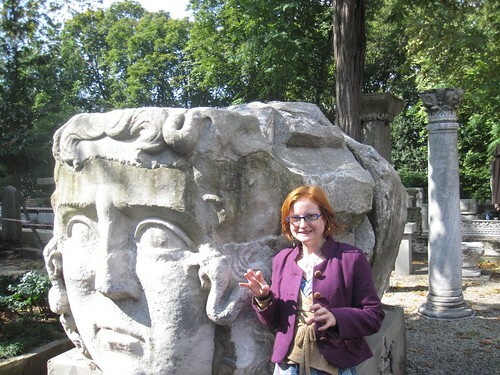 I was in Istanbul for a few days in February for a conference, which whetted my appetite. Your photos have turned it into a full-scale travel craving! Happy you were able to get out of the boot before you left and were able to enjoy the hiking there. Great photos and outfits. No wonder the German guy was friendly after you flashed him! And you are wearing jeans, surely a first!? I enjoy seeing the places you visit. Love your new jacket; looks like perfect style and color for you. Glad you got back safe but unfortunately sick! What a fun trip! 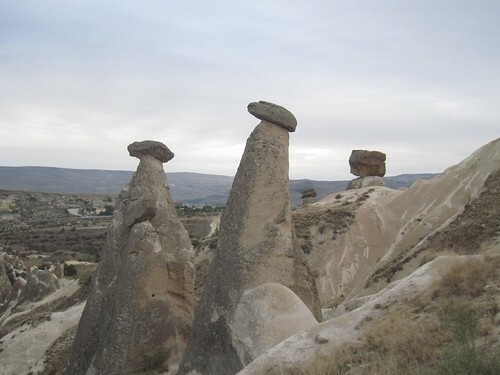 Up here in the badlands we call those kind of rock formations hoodoos :). Love the travel clothes, especially the perfect jacket. Too bad the fabric-shopping was so pitiful---truly disappointing. The two pieces look nice, though! I want to go to Turkey! I want fabulous clothes! I know I can have both of those things, but right now I am going to live vicariously through you. Welcome home! I hope your cold leaves you soon. I suppose plenty of rest will help. Your new creations look fantastic on location! The weather certainly misbehaved. I guess it is hard to know for sure what to pack, but it sounds like you just layered up and managed fine. Welcome back Trena. It looks like you saw and did some amazing things. Your new clothes look super in your photos! What a nice relief to have your leg pretty much healed by the time you left. It never feels good to have a cold, but glad you caught it on the tail end of your trip. Unfortunately for me, on my last trip, I caught mine within the first two days of my travels. Feel better soon! How does your leg feel? Are you back to the gym? welcome home trena! Thanks for sharing the photos of your glorious trip. You were definitely stylish, and now you have clothes to remind you of your trip. That not-cotton is a great print! Nice pictures--sounds like a great trip and great wardrobe. We visited last year amidst a spring snow storm in the midlands - Phil. Inquirer had a great article today on the changing climate (political) Turkey. Welcome back! It looks like you had a fantastic time despite the weather! Love the detail of the pockets on your jacket. I especially like the pocket on the inside of the jacket and the security button!!! Glad to see your leg is better.